As a Vice-Chancellor I am lucky enough to meet people on a daily basis who inspire me. They might be a student who has overcome significant hardship to be accepted into university and go on to top their class, a staff member who thinks of an innovative new way to do something, or a member of the community who is doing their bit to help others. Every now and then however you will come across someone who complete blows you away. Someone who’s story is so powerful it makes you look deep within yourself to see if you to have those same qualities. For me that happened when I had the pleasure of meeting Matthew Ames. 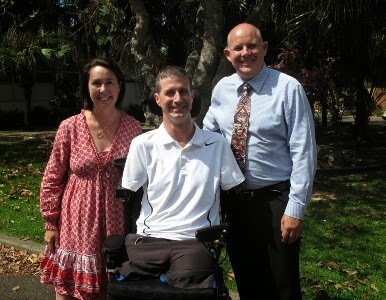 Matthew is a husband and father of four (as well as the brother of one of our lectures Dr Kate Ames), who just over a year ago suffered from a severe illness, whereby the only way to save his life, was to amputate both arms and both legs. Afterwards he was in a coma for three weeks and spent almost two months in intensive care. In the year since his operation, Matthew has made a recovery that has amazed everyone who has shared his journey, powered by love and support from his family, a positive attitude and focus on what he can do, rather than what he can't. Matthew is without a doubt one of the nicest and most remarkable people I have ever met. His bravery and resilience in the face of such adversity is nothing short of amazing. To see what he has achieved in only one short year since his illness makes you really believe that nothing is impossible. Everyone at CQUniversity was lucky enough to have the opportunity to attend a guest lecture with Matthew and I know that every single person who went along would have come away a better person because of it. Thank you so much for sharing your story with us Matthew, and also to your wonderful wife Di. QS Stars is a breakaway ratings system from the highly reputable Times Ranking System, that rates universities from around the world in categories such as internationalisation, online delivery, access, teaching, employability and research. This was our first time participating in the ratings system, and we achieved an impressive 3 stars overall, while scoring specifically a 4 star rating for both teaching and facilities. But the major cause for celebration in all of this was our 5 star rating for internationalisation, access and online delivery. We pride ourselves on being a university for everyone and to receive ratings like these for student accessibility, online delivery and internationalisation (indicated by our proportion of international staff and students, as well as the strength and number of our international partnerships) is truly a great achievement. Ratings like these not only give us all a much needed pat on the back but help us enormously to build our global reputation and attract students to our University. Participating in these ratings also provides us with a benchmark for future growth and improvement.